Not a lot of space on your counter, rut a lot of love for coffee? The best coffee makers small-sized can deliver without hogging up your valuable kitchen space. Think you’re limited on options when you’re in need of a small coffee maker for space conscious brewing? You’re definitely not! You can choose a more hands-on option like pour overs or get a drip coffee maker that makes several cups at one time while you’re ewusy doing something else. There are even machines that make specialty drinks without taking up a lot of space. Which One Does Your Kitchen Need? Here’s a low-maintenance small coffee maker option. You can get them in all sizes, from three-cup to 12-cup. They’re usually made from glass and/or stainless steel, but there’s one to match any kitchen décor, whether you like vibrant pops of color or a more rustic style. You can put it in a corner or cabinet so it’s out of the way, and it’s no trouble to pull it back out again when it’s time to use it. You’ll need coarse ground coffee for this type of maker. Pour hot water in, put the lid on (leave the plunger up), wait a few minutes, push the plunger down, and then pour your coffee. Some French presses are even low maintenance enough to be dishwasher-safe. 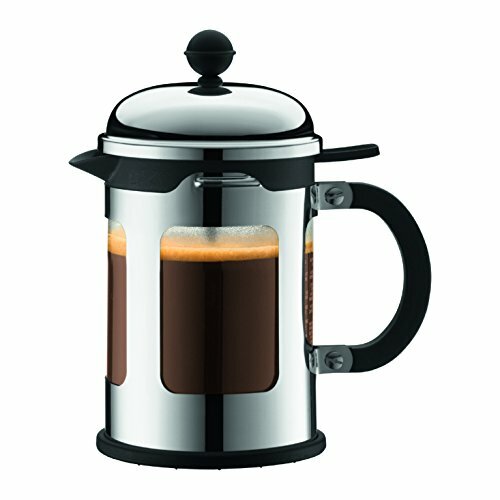 Try the Bodum Chambord French Press Coffee Maker, which comes in a variety of sizes and has a simple enough style to fit in almost anywhere. This glass, bamboo, and leather option is another classic coffee maker you can easily move to the corner or put in the cabinet between uses. Get it in three-cup to 12-cup sizes, with or without a handle. The classic line is less expensive, but the handblown one is beautiful (and available in a 13-cup size instead of 12). The simple, elegant design helps it look right at home anywhere. 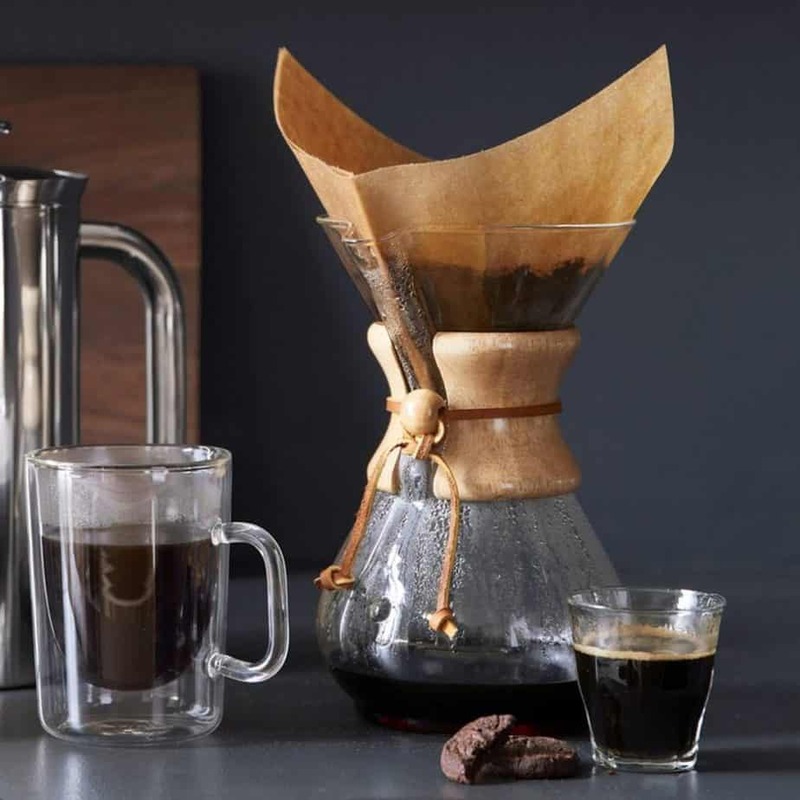 The rawhide used to only come in tan, but now you can choose from a range of colors if you want to use color to tie your Chemex in with your kitchen’s color scheme. This is a pour over style small coffee maker that allows you to make enough for more than one person at a time. When you really want to free up your counter space, a pour over coffee maker is the way to go. They’re typically small enough to fit in a drawer. You could also perch one on a shelf and use it as a decoration when it’s not being used to make coffee. They’re about the size of a mug and can be used with almost any filter type (paper, Coffee Sock, etc). There are some really beautiful ones on Etsy. If you have a local coffee shop that showcases handmade goods and art from local creatives, you may find one there, too. You can generally get one for $30.00 or less. Of course, you will only be able to make one cup at a time with it. 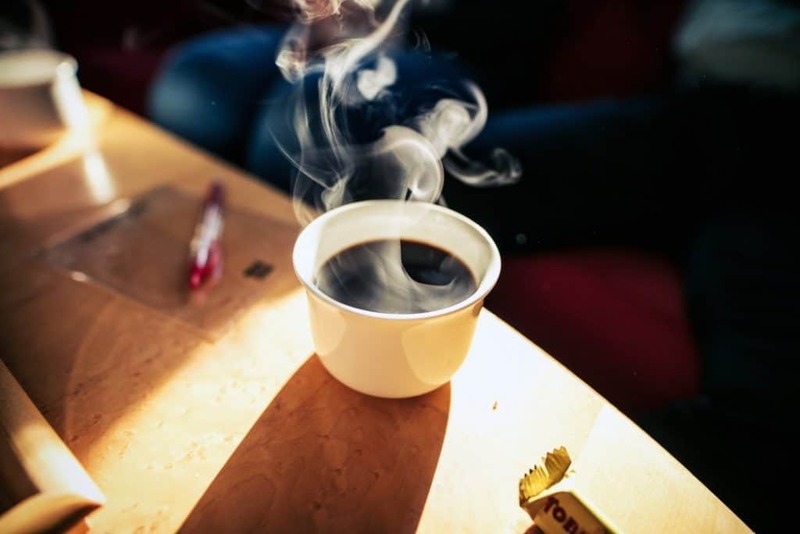 If you live alone, are the only coffee-drinker in your house, or don’t mind sharing with a significant other or roommate and taking turns with it instead of brewing a half or full pot at once, it could be the perfect solution. 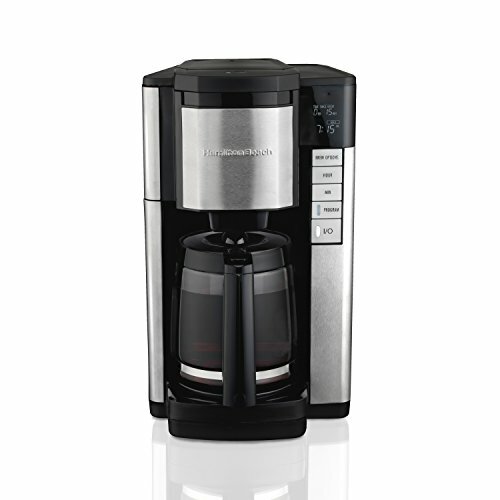 The Black & Decker Spacemaker Coffee Maker is one way to keep your counters clear. This one attaches to the underside of the upper cabinets. The designers seem to have thought of everything, down to a cord management hook. It’s 11 lbs and its dimensions are 17” x 12” x 13”. 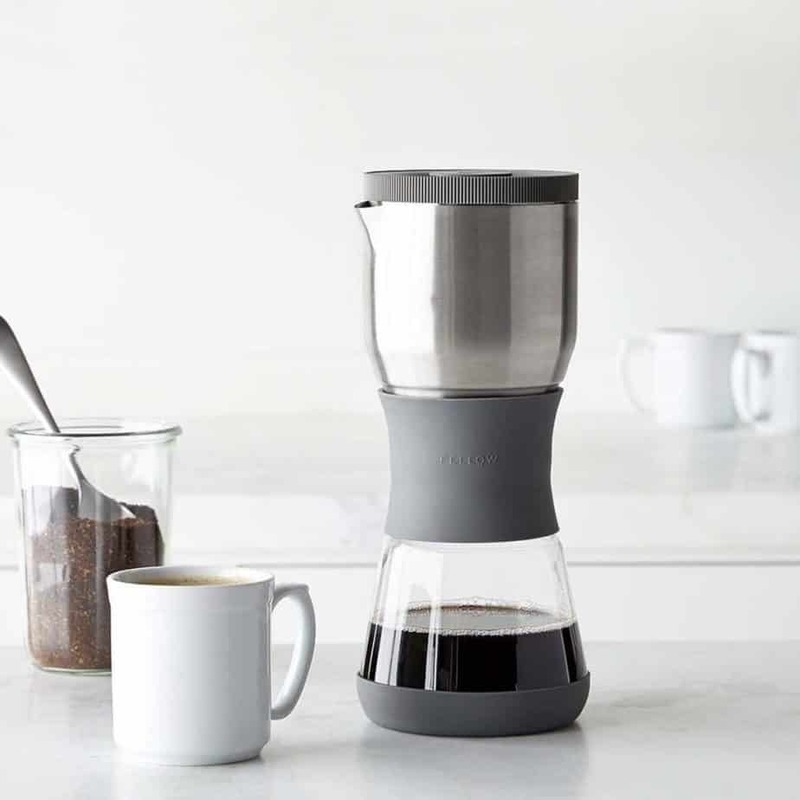 This option makes eight cups of coffee at a time and the thermal carafe keeps them warm. You can also sneak a cup while it’s still brewing if you just can’t wait, or set it to brew before you even wake up. The programming buttons are easily accessed and quick to use. There are two negatives to this one: it’s going to take two people to mount it (and some tools), and it’s one of the most expensive options on the list by far about $400.00. 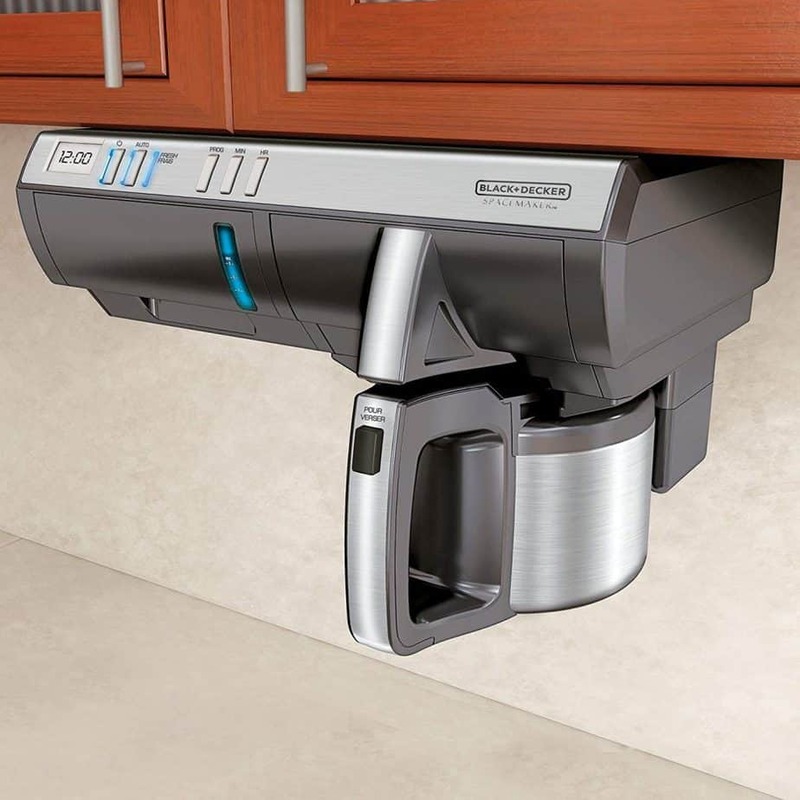 That said, if you’re space-conscious because you’re in a tiny house, apartment, boat, or RV, it may be worth the time, effort, and expense to get your coffee maker mounted somewhere that totally frees up counter space without taking up any storage space. The CHULUX Single Serve Coffee Maker stands out for its vibrant colors. Choose from black, blue, red, green, or orange. It uses capsules, but it isn’t brand-specific and allows you to keep your coffee options wide open. It’s also one of the smallest on the list, at 9.5”x 5.1” x 10.4” and 1.3 lbs. It’s even good for a dorm room. Plus it only costs about $40.00. It works fast (three minutes, total), shuts off automatically, stays cool on the outside for safety, and it’s easy to clean. Because it’s so quick to make a cup of coffee, you could easily use this in a home even if you don’t live alone. It may not be the best idea for entertaining, but it’s perfect for daily life. If you love a yesteryear vibe and multi-tasking appliances have your heart, you’ll adore the Nostalgia BSET300AQ Retro 3-in-1 Family Size Breakfast Station. 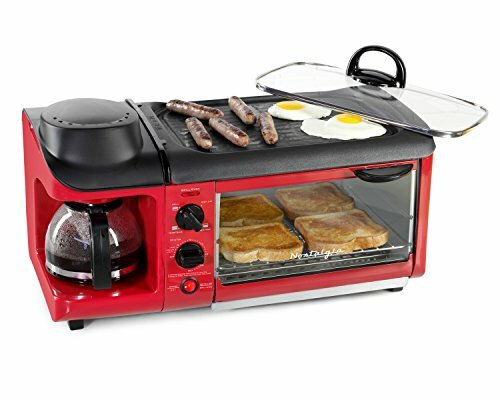 It combines a small coffee maker (four-cup) with a griddle and toaster oven. It can toast four pieces of bread, cook eggs and/or sausage, and make coffee at the same time, and automatically shut off when it’s done. There’s even a glass lid for the griddle. It’s easy to clean the toaster because the oven tray comes right out. The non-stick feature of the griddle means it’ll wipe clean without too much elbow grease, too. Expect to pay $80.00 or less, which is a great deal if you’re already on the market for a toaster oven and/or griddle as well as a small coffee maker. It takes up a little more room than some of the other options (19.2” x 11.8” x 11.5” and 12 lbs. ), but since it’s doing so many things, you may end up saving space anyway. The Nespresso Inissia Espresso Machine by De’Longhi with Aeroccino allows you to create specialty drinks at home without sacrificing a lot of space. You can make an espresso or lungo with the touch of a (programmable) button. It only takes 25 seconds to get the water hot enough to get started, then you can make nine drinks back to back before you have to refill the water reservoir. If you haven’t used it in nine minutes, it turns itself off. What’s a specialty drink without the ability to froth milk? Nothing. 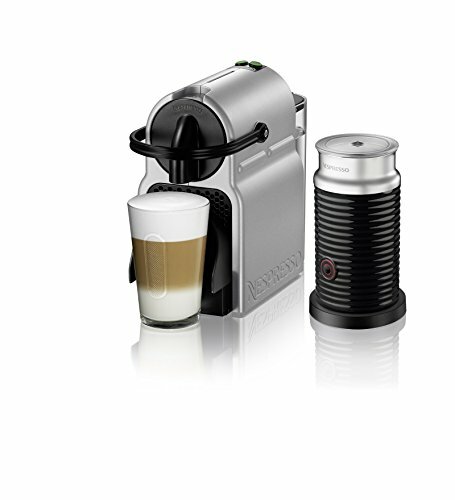 So this machine comes with an Aeroccino for frothing hot or cold milk (plus some Nespresso capsules). Tuck that away until you need it. This one is available for $200.00 or less. Its dimensions are 4.6” x 12.6” x 9.1” and it weighs 5.29 lbs. The Hamilton Beach Programmable Coffee Maker (12-Cup Carafe) is a relatively small coffee maker (11.26” x 8.2” x 14.62”) that can still make enough coffee for your own family and a couple of guests. It’s also only about $40.00 and comes with cone filters. If you’ll be putting this coffee maker on a spot below a set of upper cabinets, you’ll love that you can get to not only the brew basket but the water reservoir from the front. No need to tug the whole machine out to open a lid or lift out the reservoir, only to slide it back into place later. There are three brewing methods (regular, bold, and 1-4 cups), plus it tells you how much time has passed since the coffee was brewed so you know how fresh it is. You can easily see how much water’s left in the reservoir, pour before it’s done brewing, and get a reminder when it’s time to clean the machine. It also shuts off automatically after two hours. 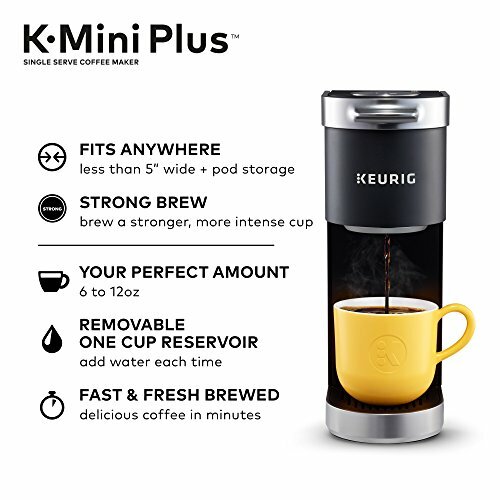 The Keurig K-Mini Plus Single Serve K-Cup Pod Coffee Maker is a minimalist’s dream. Clean, sleek lines and storage space for nine pods? Yes. It’s not even five inches wide, so no matter how much counter space you (don’t) have, you can still make this one work. Choose how much coffee you want to make in your mug, from six to 12 ounces. The reservoir is removable. Just fill it up, put it back, and brew your delicious cup of regular or strong coffee. If you forget to turn it off, it’ll automatically shut off after 90 seconds. It only costs about $100.00. The only negative to this one is the fact that it opens up instead of out, like the Hamilton Beach 12-cup option. Even then, it’s only 16.8” high, though (closed, it’s 12.1”). Dimensions are 11.3” x 12.1” x 4.5” and it only weighs 6.5 lbs. 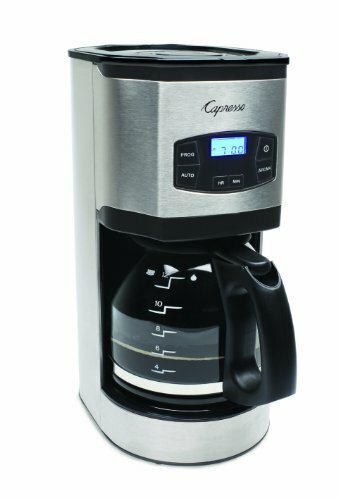 The Capresso® SG120 12-Cup Stainless Steel Coffee Maker is another small coffee maker for space conscious brewing that proves that you don’t need a ton of countertop real estate available to brew up a big pot of coffee. Plus it looks sleek and modern. It only takes about 10 minutes or less to brew that full pot, too, which is nice. If you can’t wait that long, you can stop it mid-brew and pour yourself a cup without making a mess. This coffee maker means business when it comes to extracting as much flavor as possible from your coffee. It has multiple nozzles to spray the water through the grounds (instead of just one in the middle), and there’s a special Aroma setting designed to make the brewing process take longer and bring out all the flavor. Even though it brews so much coffee, it still only weighs 6 lbs. and measures 9” x 6.5” x 13.75”. 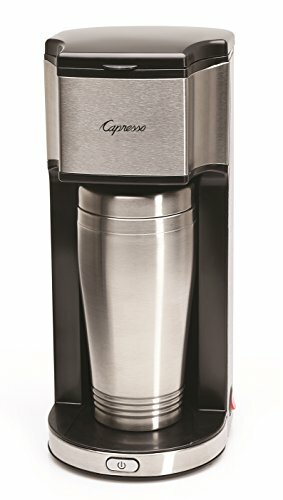 The Capresso® On-the-Go Personal Coffee Maker is an on-the-go person’s best friend. It brews straight into a travel mug (one is included, too, in case you need it) and it shuts itself off. It only takes four minutes to brew a cup, so it won’t hold you up when you’re in a hurry. Just like with the other Capresso option, the design of this one is meant to extract all the flavor possible from whichever coffee you choose to use—soft pod or ground—thanks to a larger-than-usual water nozzle. You don’t even have to worry about keeping filters in stock because this one’s is permanent. It’s also removable for easy cleaning. The filter, mug, and filter basket can all be washed in the dishwasher. It weighs a whopping 3 lbs. and is 6.5” x 5.25” x 12”. You’ll only have to pay about $40.00 for it. 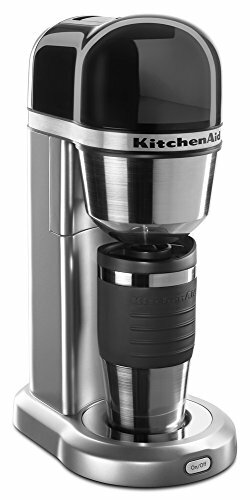 The Kitchen Aid® Personal Brewer Coffee Maker is available in sleek Contour Silver and brilliant Empire Red. It’s another small coffee maker for space conscious brewing in the homes of busy people who are always on their way out the door. Make 18 ounces of coffee right into your travel mug (a matching one—hand wash only–is included), grab it, and go. 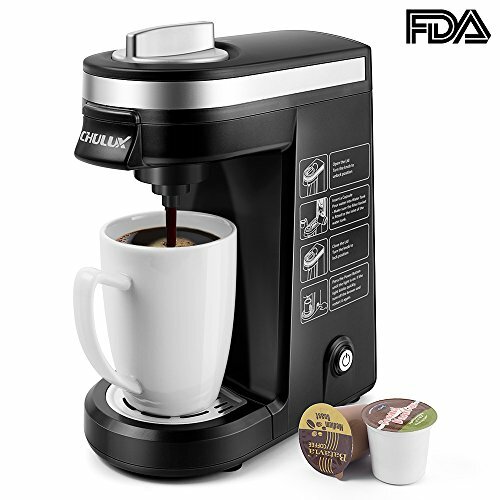 You’ll be using your own regular coffee for this, not pods or capsules. There’s a gold-tone, permanent filter that is easy to clean. It weighs 8 lbs. and will take up a little more space than the Capresso model (12.5” x 8.8” x 15.75”). You can hide and store the cord when it’s not in use. Once you’ve answered those questions, you’ll be able to pick the best, smallest coffee maker for space conscious brewing for your specific area of counter space.